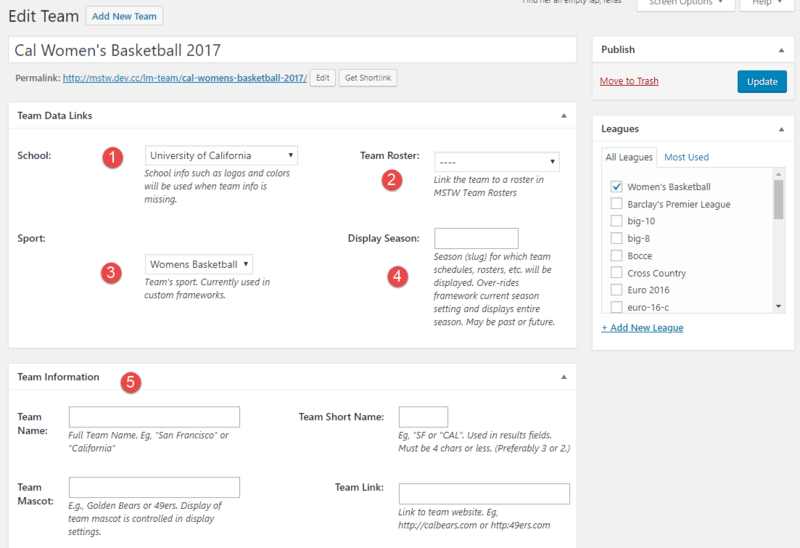 The Schools database is a way to reduce your data entry load for teams, and simplify changes to the basic properties of teams. Previously with MSTW League Manager a lot of duplicate information had to be entered for teams in the same school. Now with the MSTW League Manager Add-ons, you can assign a team to a school and eliminate much of the required data entry. When the League Manager Add-ons plugin is installed the Team Data Links metadata box is added to the Edit Team screen as shown below. 1. School: Link the team to a school (which must already exist in the Schools database). 5. Team Information: All this information has been entered for the school, so no entries are required. However, if a team is not linked to a school, then you should enter this data as before.